Zaluzianskya ovata is lovely new fragrant plant, commonly referred to as Night Phlox. These plants come originally from the Drakensberg Mountains in South Africa and seem to have reasonably good hardiness in the UK. They have dark green aromatic evergreen leaves and brilliant white flowers with red reverses in June and July, growing to a height of about 40cm. The flowers curl up in the middle of the day and come out at dusk, with an intoxicating scent at night! Zaluzianskya grow best in sun and in moist, rich well drained soil. Given sharp drainage and sheltered position they will most likely survive UK winters, but grow in pots and protect in colder parts. They look good in rock and alpine and raised gardens. A mouthful of a name maybe, but in fact, named after Adam Zaluziansky von Zaluzian, a 16th-century Czech botanist. A puzzle then that this relatively unknown South African plant was named after the first man to call for the separation of botany from medicine. Zaluzianskya ovata is a compact plant that never grows to much more than 30cm across and just 30cm or so high, with an aromatic, evergreen foliage that forms a dense, neat ball. From May/June the plant is covered with deep maroon buds that have the appearance of match red heads. During the early part of the day these open to reveal pure white upper parts to the flower, which is made up of heart-shaped petals, but during the hottest part ofthe day they close up.It is not until evening that they splay wide open to reveal the true joy of this plant: a rich and heady perfume. Night-scented plants are not uncommon, but this unusual plant is so small and produces such an overwhelming scent. Growing a pot of it on the terrace is to be recommended as on a warm summer's evening it will fill the air with a sweet fragrance. Zaluzianskya ovata needs a good, rich soil that is moist during the summer but well-drained in winter. It is really only reliably hardy given these requirements except in mild areas or warm, sheltered spots, so it is otherwise best grown in pots. 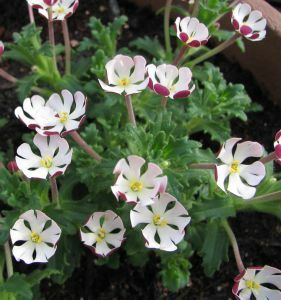 Zaluzianskya ovata can be grown in pots and containers or in raised beds, alpine gardens or just at the front of flower borders. It is particularly effective in pots placed on the patio where the scent can be admired on warm evenings. Pruning \ Aftercare : Trim as required.